oh, canada! oh say can you see? 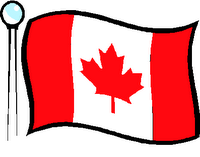 tomorrow's canada day, my first ever as a wannabe canadian! we will be celebrating canada's heritage by doing more crap around the house (the list is neverending) and going to a barbeque at the in-laws house. canuck's family will be visiting from montreal, and for the first time in the 7 years that canuck and i have been together, i will be meeting the infamous "uncle frank". then we leave bright and early sunday morning to head back to the states to celebrate the fourth of july! i'm very excited, i haven't seen my mom in three months! friendly neighbor story: gary, the self proclaimed "wingnut who lives across the street" is a really nice guy, now retired and a former canadian military man (don't see much of that around here, let me tell ya!). he's been hanging up the italian flag in honor of the world cup for his italian wife and the flags of ontario and obviously canada in honor of canada day. anyways, we saw an american flag hanging outside his garage and we were like, hmm, that's interesting (since canadians are not exactly pro-american at the moment). when canuck ran into him the other day, they were chatting for a while and it came up about all the flags on his front lawn, including the US flag. which, it turns out, he hung in my honor to "welcome me to the neighborhood". what can i say, that's awesome! we're all moved in, and we're now officially homeowners! i even think the first mortgage payment is due this week, hmmm... this will be a short post, since i have a crapload of stuff to do, but we're still alive and kicking and very happy to be in our new home! i already have a ton of stories about our house, our neighbors, cookie's new room, and other adventures new homeowners experience. as of may 31, i can officially say that i am a homeowner! not that i've been able to spend a night at my new digs, since 3/4 of our crap is sitting in the garage and the remaining 1/4 is scattered all over the house, looking for a place to call home. so much to do, which is why i haven't posted in a while. but i have a house, i have a house, i have a house, so i can't complain! canuck is agonizing over which TV and internet service provider he's going to choose. i myself do not care much about these things, as long as i can access ebay, the news, and watch my thursday night lineup. i myself agonize over crap like color schemes and what kind of duvet cover would look best with our shiny new/used bedroom furnitre (i caved on that one). all of the wedding china has been unpacked, but i just can't seem to find my regular cups and dishes. and i found my toaster oven and blender, but seemed to have misplaced my microwave. i have pans, but no pots, and i have a waffle maker, but no griddle. a mish-mash to sort through. i'll make a full meal sometime next winter.